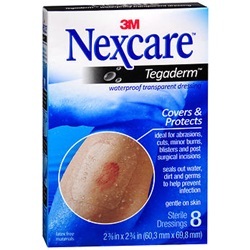 Film Dressings - Tegaderm 2.375" x 2.75"
Nexcare Tegaderm Waterproof Transparent Dressing is sterile and measures Film Dressings - Tegaderm 2.375" x 2.75". Latex Free. Comes 8 per box. 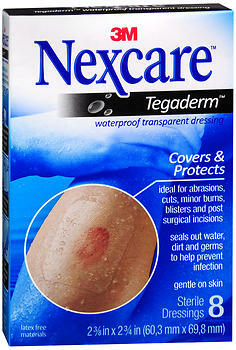 Nexcare Tegaderm Waterproof Transparent Dressing is the #1 hospital brand in transparent dressings. The unique properties of Nexcare Tegaderm Waterproof Transparent Dressings make it flexible with your body and breathable for greater comfort while protecting abrasions, cuts, minor burns, blisters and post-surgical incisions. It is waterproof, staying on in the bath or shower, and seals out water, dirt and germs to help prevent infection. Tegaderm Dressing can be worn for up to 7 days, making it ideal for securing IV catheters or other tubing, and for post-surgical dressings. With all that, it is still gentle on the skin, protecting even reddened or fragile skin. Tegaderm Waterproof Transparent Dressings are also hypoallergenic.